Three-dimensional (3D) modelling and visualisation is one of the fastest growing application fields in geographic information science. 3D city models are being researched extensively for a variety of purposes and in various domains, including urban design, disaster management, education and computer gaming. These models typically depict urban business districts (downtown) or suburban residential areas. Despite informal settlements being a prevailing feature of many cities in developing countries, 3D models of informal settlements are virtually non-existent. 3D models of informal settlements could be useful in various ways, e.g. to gather information about the current environment in the informal settlements, to design upgrades, to communicate these and to educate inhabitants about environmental challenges. In this article, we described the development of a 3D model of the Slovo Park informal settlement in the City of Johannesburg Metropolitan Municipality, South Africa. Instead of using time-consuming traditional manual methods, we followed the procedural modelling technique. Visualisation characteristics of 3D models of informal settlements were described and the importance of each characteristic in urban design activities for informal settlement upgrades was assessed. Next, the visualisation characteristics of the Slovo Park model were evaluated. The results of the evaluation showed that the 3D model produced by the procedural modelling technique is suitable for urban design activities in informal settlements. The visualisation characteristics and their assessment are also useful as guidelines for developing 3D models of informal settlements. In future, we plan to empirically test the use of such 3D models in urban design projects in informal settlements. The South African government is party to the United Nations Millennium Development Goals (MDG) that aim to significantly improve the lives of at least 100 million inhabitants by the year 2020 (MDG 7, target 4).5 As a result, the government is obligated to assist the inhabitants of informal settlements or slums to improve their living conditions. In response to the MDGs, the National Housing Code by the Department of Human Settlements proposes a process for the upgrading of informal settlements.6 The South African Housing Programme is described in Part 3 of this Code and aimed to improve the lives of 2.2 million households living in informal settlements by 2014. Additionally, the South African National Development Plan (NDP) identified informal settlement upgrading or relocation as one of its main objectives7(p489): by 2030 all informal settlements located on suitable land should be upgraded, or else relocated to suitable land. To achieve the objectives set out by the MDG and NDP urban design of informal settlement upgrades, such as the construction of a community hall, taxi rank, health clinic or playground, needs to consider both humans and the natural environment. Urban design is concerned with shaping the physical environment of cities, towns and villages, while considering human behaviour, aesthetics and functionality.8,9 In highly dense urban regions (i.e. cities, such as New York or Hong Kong), urban design aims to create public spaces from the areas between buildings where activities, for example street markets, can take place.10,11 Similarly in urban planning, the human is the central component in the process. Urban planners tend to focus on designing and planning large areas for future use, e.g. new infrastructure,12 and set out a strategy for crisis management.13,14 While there are urban design visionaries, such as Lynch9 and Montgomery15, who describe how urban design can shape the development of a city so that it becomes a functional and aesthetically pleasing environment, urban design tends to focus on enhancing the current localised environment. An important component of urban design in a democratic society is involving and communicating planned changes to various stakeholders. Geovisualisation of spatial data is a powerful tool in this communication. Over the years, spatial data have been represented in various formats ranging from two dimensional (2D) maps, three dimensional (3D) physical scale models, to 3D digital representations. Recently, 3D geovisualisations have grown in popularity, partly through the availability of applications such as Google Earth (https://www.google.com/earth/) and NASA World Wind (http://worldwind.arc.nasa.gov/java/). Numerous studies have been conducted on various aspects of 3D city models, but these are limited to urban environments (i.e. city centres). 3D models of cities are used in various application fields, such as urban planning, disaster management, computer games, entertainment and education.18,20 3D models of informal settlements could also be used in these application fields, however research on their use is limited to exploratory studies in a few countries21 and to our knowledge has not been done in South Africa. The goal of this article is to describe a procedural modelling process to generate a 3D model of an informal settlement in South Africa, and to evaluate the applicability of the resulting model in urban design activities. We adapted visualisation characteristics of 3D models of buildings in city planning for the specific requirements of urban design activities during informal settlement upgrades in South Africa. Then we assessed the importance of each characteristic for such activities. We developed a prototype 3D model of a part of Slovo Park, an informal settlement in Johannesburg, South Africa, and evaluated its visualisation characteristics. 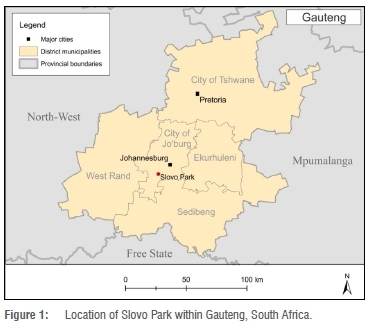 Slovo Park is an informal settlement situated roughly 10 km south of Soweto, in the City of Johannesburg Metropolitan Municipality, South Africa (See Figure 1). It is located adjacent to a large freeway and is surrounded by industrial factories. There are approximately 1100 stands in Slovo Park, laid out by the community (i.e. not officially surveyed). The local municipality provides only rudimentary services in the form of waste and sewerage collection, and communal taps. The residents do not have access to formal electricity (See Figure 2). The 3D model described in this article is merely a proof of concept, and thus only a sub-section of the settlement was selected as the study area. The study area contains various types of human-made constructions, such as a community hall (central meeting place for the community), a shebeen (local term for a bar), and surrounding dwellings (typical shelters found in an informal settlement). A procedural modelling process was developed as an alternative to manual modelling of informal settlements for planning upgrades. Procedural modelling iteratively applies algorithms and rules to an initial 2D shape that is replaced by a 3D object afterwards.28,29 Natural real world systems can be realistically replicated with procedural modelling as it utilises parameterisation that allows infinite variation in the generated model.29,30 However, identifying the correct parameters and values to generate a photo-realistic model is not feasible. The procedural modelling process described in this article was derived from the visualisation pipeline and adapted for procedural modelling. The visualisation pipeline defines the process required to create visualisation from raw data.35-37 The basic visualisation pipeline consists of filtering, mapping and rendering.36,37 During the filtering phase, the data are converted and a subset of the data is selected. Thereafter, the data are transformed into geographic primitives during the mapping phase. Lastly, the geometric primitives are converted into realistic images, i.e. they are rendered. Our procedural modelling process is depicted in Figure 3. 3D objects can be characterised according to the level of detail (LoD) with which they represent objects in the real world. This LoD ultimately determines the model's applicability.38 One of the simplest reasons for using LoD in 3D models is to reduce the complexity of the geometry before rendering. Biljecki et al.39 suggested additional advantages for using LoD, e.g. to specify the level at which 3D data are captured, and for generalisation during rendering. LoDO is the 2.5D representation of the basic outline of objects, typically a flat polygon. LoD1 is achieved when the volume of objects is modelled in a generalised fashion with the inclusion of vertical walls and flat roofs. LoD2 builds on LoD1 with the addition of a roof structure, as well as the inclusion of texture or photography on surfaces and terrain. LoD3 is an extension of LoD2 with the inclusion of openings, such as windows and doors, and by adding more detailed roof structures. In LoD4, the interiors of buildings are added to the model. 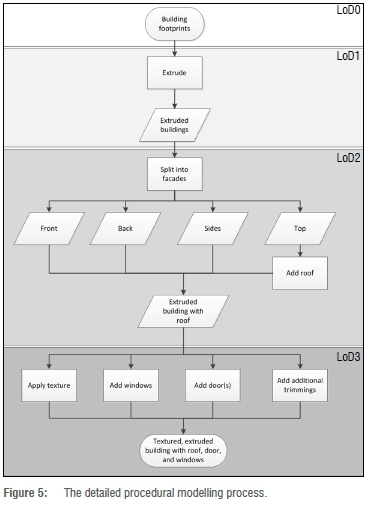 During implementation, the steps identified in the section above on the procedural modelling process were refined and a detailed procedural modelling process was developed, depicted in Figure 5. The process was implemented in CityEngine (http://www.esri.com/software/cityengine) and CGA (Computer Generated Architecture). After completion of a phase in the process, the resulting model can be related to a specific LoD. The prototype model of Slovo Park was modelled up to LoD3. The interiors of the informal structures (LoD4) were not considered, as these are deemed unnecessary for urban design. LoD0 is the most simplistic level; it consists of building footprints and terrain. Building footprints are commonly represented by 2D simple geometry. LoD1 was attained through the extrusion of the 2D building footprints into 3D cuboids. Each 2D geometry (or building footprint) in LoD0 was assigned a height value. The CGA extrude command was then executed to produce 3D geometric objects with the generalised volume and depth of the real world features. The dwellings were extruded to a height of 1.9 m, as this was observed to be the average height in the field. Figure 6a is an example of such a dwelling. In-situ measurements were taken of the community hall and the height of the structure was found to be approximately 2.3 m (See Figure 7a). The community hall was extruded accordingly. Procedural modelling allows users to extrude all of the building footprints simultaneously, compared to manual modelling which requires individual extrusion. With procedural modelling, structures can either be extruded to a predefined height, or a random height within a specified range. The result of the LoD0 to LoD1 transformation (i.e. the LoD1 model) is shown in Figures 6b and 7b. The 3D object at LoD2 starts to resemble its true form. A LoD2 model is attained when a roof is added to the LoD1 shape or object.18 Typically, roofs have a triangular shape, however, most structures in informal settlements have flat roofs. Gröger & Plumer18 argue that a horizontal roof is an attribute of a LoD1 model (refer to Figure 7b). To enable the modelling of more complex objects (at higher LoDs) using procedural techniques, the objects have to be separated into different components or objects, called facades. In our model, we used the CityEngine split command to divide an object into facades. The following facades (or objects) were generated: front, back, sides, and top. An advantage of procedural modelling is that these facades are now independent objects that can be modelled separately (e.g. different combinations of facades). Because there is an explicit top facade (the roof) after the execution of the split command, structures with flat roofs are now LoD2 objects. Semantic information (e.g. descriptive attributes) can be added to each of the facades so that complex analysis can be performed on the 3D model. LoD3 was achieved by adding windows and doors to the objects and by adding texture, resulting in a more complex geometric object that resembles the physical environment more closely. For the informal dwellings in our model, the front facade was split into seven sections, as depicted in Figure 8. Sections S2 and S6 in Figure 8 were divided into three sections, each along the y-axis so that two windows could be created in the wall. Each window was then split in half along the x- and y-axes to form burglar bars, a common feature in South Africa, even in informal settlements. The informal structures are constructed mainly from corrugated iron. The corrugated iron was modelled recursively by splitting the front facade (excluding the windows and door) along the x-axis at an interval of 0.10 m. The remaining facades did not contain any windows and therefore only the corrugated iron was modelled for them. The resulting 3D objects at LoD3 can be seen in Figure 6c and 6d. The same recursive splitting technique was used to generate the texture of the community hall (Figures 7c and 7d). The other objects in the 3D model, such as outside toilets and post boxes, were generated using similar techniques. 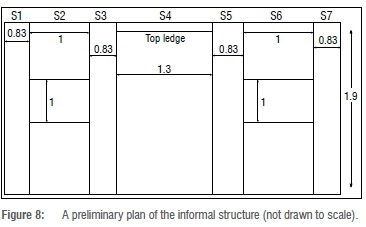 The final results of the model can be seen in Figure 9. Visualisation can support the urban design process at various stages, including the initial gathering of information about the environment; when designing or planning new developments; and for communicating the planned changes to stakeholders. In this section, we describe the visualisation characteristics of 3D models of informal settlements. The characteristics are adapted from those described by Dickmann and Dunker41 for 3D building models in urban planning. They defined three categories of characteristics: visualisation content; visualisation application environment and functionality; and visualisation performance. Drawing on discussions with experts, informal settlement inhabitants, as well our experience in urban design projects and informal settlement upgrades, the characteristics by Dickmann and Dunker41 were adapted for use in 3D models of informal settlements in urban design (as opposed to urban planning) activities in South Africa. First, we expanded the visualisation content category by including human-made structures, landmarks, the movement network and service delivery infrastructure. We split vegetation and street furniture into two distinct characteristics. While vegetation in urban areas tends to be cultivated and arranged in an orderly fashion (similar to street furniture), vegetation in informal settlements usually comprises remainders of natural vegetation and haphazardly distributed trees, shrubs and patches of grass. Therefore, it needed to be considered separately. In the category of visualisation application environment and functionality, we combined the pedestrian perspective and bird's eye view into a single characteristic. The remaining characteristics in this category and the visualisation performance category were adapted. Dickmann and Dunker41 concluded that the importance of visualisation characteristics varies among different users of 3D models of buildings in city planning. For example, LoD1 or LoD2 are sufficient for planning experts, but community members prefer more detail and textures. 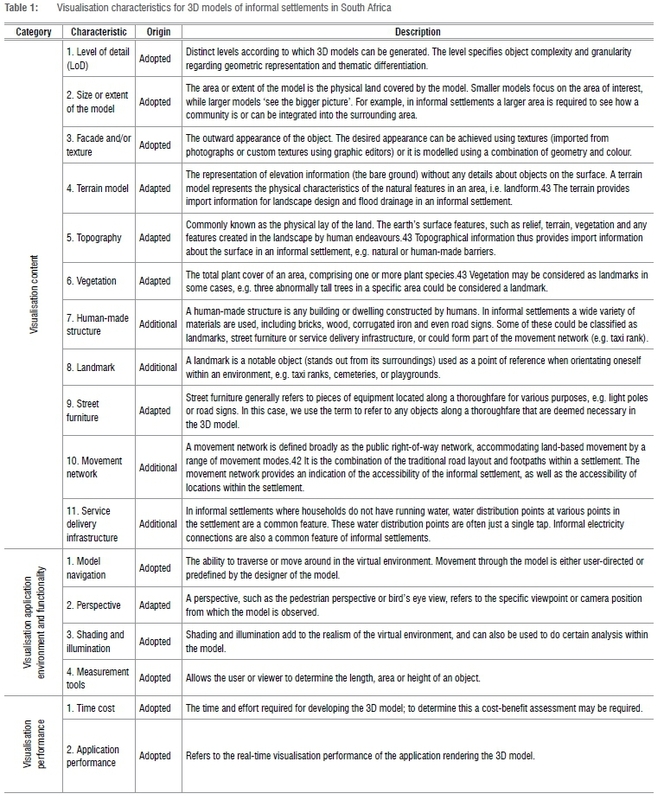 Based on their findings and our experience in urban design and informal settlement upgrade projects, each criteria identified in Table 1 was assigned an importance ranking, ranging from no contribution to major contribution (refer to Table 2). Contribution refers to our assessment of how important the specific visualisation characteristic is regarded by various stakeholders (e.g. settlement dwellers, planners and officials) when using the 3D model in urban design activities. For communicating planned upgrades, it is important that 3D models, specifically for the area of interest, be generated at a high LoD, such as LoD3. The higher LoD creates a more realistic and relatable 3D model. If stakeholders can recognise aspects of the environment, they can more easily relate to the model. Consequently, they will have a better understanding of the effect that proposed upgrades may have on their daily lives and environment. The surrounding area is acceptable at a lower LoD. Similarly, a lower LoD is typically sufficient for planning experts when gathering information about the current environment before planning and designing upgrades. Our research demonstrated that procedural modelling is a viable alternative for generating a 3D model of a typical South African informal settlement at LoD3 (Refer to Figures 6 and 7). Roofs, windows and doors were modelled procedurally through either adding geometry or splitting up existing geometry. Substantial initial preparation is required for procedural modelling, however, once the correct dimensions of the objects have been calculated, the procedural technique to model the objects is straightforward and can be repeatedly applied. The size or extent of the model is determined by the planner, and influenced by upgrades where the integration of the area of interest with the surrounding community needs to be considered. However, we consider the size or extent less important for urban design activities, which tend to be localised, in comparison to regional or city planning which needs to consider a wider area. Procedural modelling provides an effortless method of populating the background (space beyond the area of interest) of a 3D model through the repetitive execution of the same procedures with different parameters. There is no limit on the size of the model that can be created with procedural modelling. Facades and/or texture are less important in informal settlements (similar facades and textures on human-made structures) than in urban areas (more variety in building facades and textures) when collecting information about existing environment or designing upgrades. 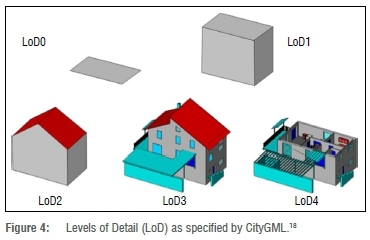 LoD3 provides sufficient detail about 3D objects to make a model suitable for communicating information about the existing informal settlement. Additional details could prove useful when it is important to communicate the specific facade or texture of a planned building. Detailed facades comprising irregular shapes are time-consuming and tedious to create with procedural modelling. However, once the facade details have been modelled, they can be flexibly combined into a variety of different facades. Various texture libraries are available online and these can be included in the models, as necessary. A model of the terrain also provides useful information when considering integration. For example, it could allow the identification of possible natural barriers (e.g. a donga, hill or mountain) to integration into the surrounding area. However, a terrain model also aids in identifying physical risks to the settlement, such as the risk of landslides or flooding. Informal settlements often arise on land not suitable for development, so physical risks may be significant. Therefore, the terrain should always form part of the 3D model of an informal settlement. Aerial imagery draped over height maps can be used to depict various landforms. Such 'draping' is possible with procedural modelling. Terrain modelling, however, was not relevant in this particular study area (Slovo Park) as it is relatively flat. Topographical information adds the required detail resulting in a more realistic and relatable model. Topography may also provide reference points to the audience in the public participation process. When considering the integration of the settlement with the surrounding community, topographical information may point out how certain features separate the settlement from the surrounding area. For example, South African 1:50 000 topographic maps include prominent rock outcrops, mine dumps or excavations, graves and powerlines. Such information would already have been considered during planning in a developed urban area, but may significantly impact the location and distribution of planned upgrades in an informal settlement that arises spontaneously. Therefore, we consider this characteristic more important in informal settlements than in urban areas. Procedural modelling provides tools to automate the conversion of topographical information from vector data (e.g. in SHP files) into 3D objects. Vegetation adds realism to the model, and in some cases, could act as a landmark. Vegetation is, however, a minor consideration when modelling an informal settlement because much of the vegetation is usually destroyed during the construction of the settlement. If a certain element of the vegetation is also a landmark (e.g. an unusually tall tree), then it should be included. In procedural modelling, vegetation is added to the model as an object and then manipulated procedurally. For example, the size of the tree can be increased or additional trees can be added recursively. Informal settlements comprise human-made structures, mainly in the form of informal dwellings. Such dwellings are typically conglomerations of cuboids. Procedural modelling allows developers to generate large quantities of informal dwellings with a single command call in a simple script. More complex structures can also be generated, however, they may require initial preparation (similar to the process for higher LoDs). The human-made structures provide context to understand how planned upgrades relate to and impact on the current environment. For example, it could help inhabitants to understand how accessible a planned community hall, clinic or playground is to their own dwelling. Human-made structures are also considered by planning experts to ensure that the planned upgrades 'fit' with existing dwellings (e.g. avoid destruction of, or are in too close proximity to, dwellings). Informal settlement dwellers place great value on certain landmarks within their community. These landmarks could be of social (e.g. community hall, shebeen or water distribution point) and/or cultural (e.g. cemetery or church) importance to them. It is important to include these landmarks in the model, as they provide context for the stakeholders. As there typically is no street furniture in an informal settlement, its contribution to 3D informal settlement models is limited. Street furniture should only be included when referred to specifically and when included in planned upgrades. The movement and access network needs to be considered when planning upgrades. For example, access to economic centres, education and health services should be taken into account. Informal settlement dwellers commonly do not own cars and often walk or take public transportation to their destinations. All aspects of the movement network, such as roads, taxi ranks and footpaths, need to be included. The movement network is important for determining how best to integrate the settlement into the surrounding community, and also to determine accessibility of a planned upgrade within the informal settlement itself. Existing streets can either be imported into the model (e.g. from a SHP file or spatial database) or grown algorithmically to align with existing buildings and terrain. Service delivery infrastructure is of concern when the planned upgrades involve upgrades to the infrastructure, the construction of new infrastructure or if planned upgrades are close to existing infrastructure. Infrastructure objects, such as water meters, street lighting poles and electricity distribution boxes, are typically scarce or non-existent in informal settlements. However, it makes sense to at least consider 'other' types of service delivery objects, such as water distribution points and illegal connections to the electricity network (also known as izinyoka), as they often pose significant risks to inhabitants. In procedural modelling, 3D objects can be added from libraries (collections of objects that may be shared and reused). A South Africa-specific object library does not exist. Thus 3D objects resembling South African service delivery (e.g. izinyoka), vegetation (e.g. indigenous trees) and street furniture (e.g. road signs) had to be developed from scratch for this study. The ability to explore or navigate through the 3D model is a significant consideration when selecting a visualisation application to plan the upgrades (planners) and to demonstrate the planned upgrades to stakeholders (officials and inhabitants). Although interoperability issues still exist, most applications can currently export 3D models into diverse formats for use in a variety of applications. An intuitive mechanism for moving within the model allows unskilled individuals to explore the model and thus better understand the planned upgrades. Alternatively, videos of different view paths through a 3D model allow users to experience specific parts of the model, for example, the area of interest. Such videos can be made available on the Internet for easy access by stakeholders. Different perspectives, such as bird's eye view or the pedestrian perspective, allow the 3D model to be viewed from several angles or viewpoints. Different perspectives are important for officials and experts during the planning stage (e.g. to evaluate the impact of a large building) and for communicating upgrades (e.g. to understand the impact of a large building) to stakeholders. Shading and illustration are common functionalities in most 3D modelling applications, allowing analyses to be performed, for example, to evaluate solar radiation availability. Shading and illustration are more important to planners than to the public and are used, for example, to analyse the availability of solar radiation on the roofs of informal dwellings after construction of a double storey community hall. Owing to the increased use of solar energy in informal settlements, we consider this characteristic more important in 3D models of informal settlements than in 3D models of urban areas, and also more important in urban design than in urban planning. The importance of measuring tools depends on the purpose of the 3D model (e.g. to communicate an initial proposal vs the final plan). Measuring tools are generally more important during planning than during communication with stakeholders. Procedural modelling produces proportionally accurate models, as calculated dimensions are used to iteratively generate the objects in the model. Navigation, perspective, shading and illumination, and measuring tools are tool-specific functionalities and are not relevant during the procedural modelling process. Using procedural techniques for generating intricate 3D models, especially if they contain complex geometric details, is initially time-consuming (time cost), as it requires extensive planning and preparation. But once the initial model is generated, modifications can be made by adjusting parameters, commands and scripts. Large quantities of 3D objects can be generated with a single script. Procedural modelling makes it possible to prepare models with semi-realistic structures with minimal effort, and yet, the models contain enough detail for planning, analysis and communication during urban design activities. For financially constrained municipalities in South Africa, procedural modelling could be a cost-effective alternative to expensive manual modelling techniques. Initially, procedural modelling has a steep learning curve for users who are not familiar with scripting and the concepts of spatial data and 3D modelling. This needs to be considered when evaluating return on investment from the use of procedural modelling. Procedural modelling is performed using scripts that extrude and generate 3D objects from 2D geometries. The real-time performance of the visualisation application relies on the computer specification. The application must be able to handle large amounts of data and render high quality 3D models in real-time. For the Slovo Park model, a standard desktop PC was sufficient. In this article, we discussed the procedural modelling process followed to develop a 3D model of the Slovo Park informal settlement. 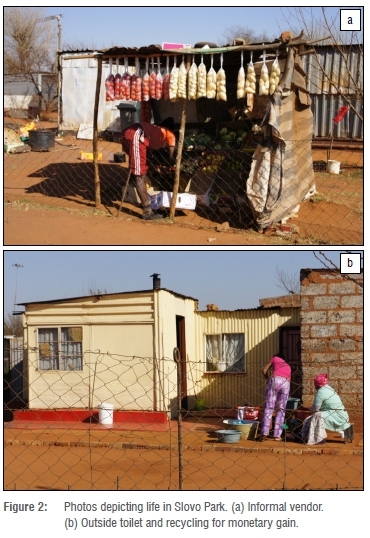 The visualisation characteristics of the resulting model were evaluated for use in urban design activities in informal settlement upgrade projects in South Africa. The description and assessment of visualisation characteristics indicated a number of unique challenges for the use of 3D informal settlement models in urban design activities. For example, visualisation content, such as human-made structures and the movement network, are considered important for informal settlement upgrades, but not for modelling typical city centres. On the other hand, facades and/or textures, vegetation and street furniture are less important in informal settlement models than in models of city centres. Increased use of solar energy in informal settlements raises the importance of shading in 3D models of informal settlements. The visualisation characteristics and their assessment in this article are also useful as guidelines for developing 3D models of informal settlements. Procedural modelling was found to be a viable alternative to the traditional time-consuming manual modelling process for typical South African informal settlements. With procedural modelling, planners can produce cost-effective 3D models for planning and communication during urban design. Although procedural modelling requires initial preparation, once the groundwork is complete, high quantity and quality 3D objects can be generated in near real-time. The scripts can also be reused and customised to prepare models for more than one settlement. However, some challenges exist, such as the initial preparatory work, the steep learning curve and the lack of a 3D object library for South Africa. The resulting model will always be an abstraction and never truly photorealistic as models resulting from LiDAR data or pictometry images are. Nevertheless, research has suggested that non-photorealistic models can still be a valuable resource for urban design. This article described the frameworks for the development and evaluation of 3D informal settlement models in urban design activities during informal settlement upgrades. In future, we plan to design and perform user studies to empirically evaluate the use of 3D models during preparation, planning, design and communication of informal settlement upgrades in urban design projects. In addition, the development of a South Africa-specific 3D object library for procedural modelling of informal settlements needs to be explored. Y.B. developed the 3D model and procedural modelling process as part of her postgraduate studies under the supervision of V.R. and S.C.; V.R. refined the visualisation characteristics as part of her PhD research under the supervision of S.C.; C.C. provided urban design input; V.R. and S.C. wrote the majority of the article; and the evaluation of the visualisation characteristics was done jointly by the four authors.